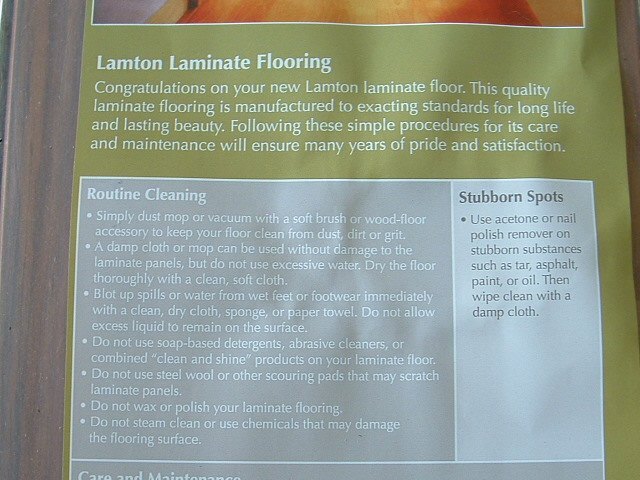 Lamton laminate flooring is a great choice. 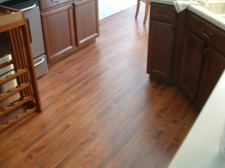 I had the privilege to install this flooring for a customer who purchased it on the internet. Their order arrived complete and was delivered directly to their home from Build Direct. The planks measure 4 feet long by about 8 inch wide and 12mm thick (.47 inch). The 12mm product line has a lifetime warranty. 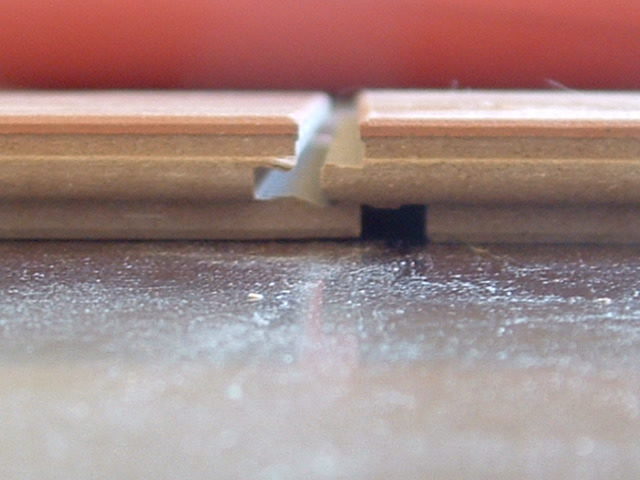 Panel surfaces are AC3 abrasion rated. 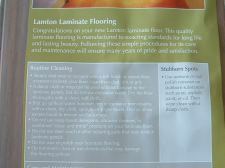 Lamton laminate flooring is manufactured with the most advanced German production line technology. The photos on this page are the pecan color laminate. The surface has the hand scraped appearance. I have added some links here so my readers can check out the cost of this product and read some testimonies from satisfied customers. My clients were very pleased with the price and service they received from BuildDirect.com. Even with the shipping cost the overall prices from this merchant beats local prices. Check out their deals upper right hand corner. Their Toklo laminate incorporates the Pergo locking system which is also installer/DIY friendly for installation. 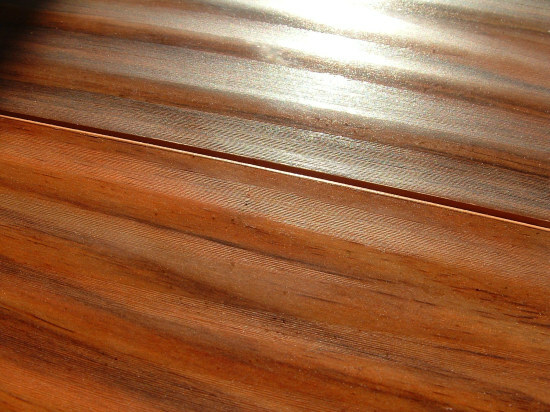 In this photo to the left you can see the beautiful appearance of the hand scraped finish. Lamton laminate flooring features the Uniclick ® glueless locking system, under strict license from Unilin. 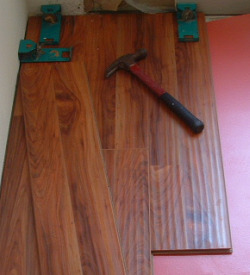 Installation is fast and easy, which allows the planks to be easily installed . While installing this flooring I noticed it took a little more force in tapping the boards together compared to a 7 or 8mm product. It was well worth the effort. 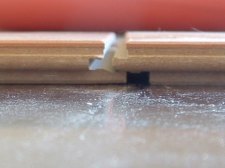 The joints on this flooring are not going to separate. At 12mm thick it feels like real wood flooring. I installed some Kahrs real wood hand scraped flooring, there is not much difference in the appearance between the two. Although the cost between the two is significant. 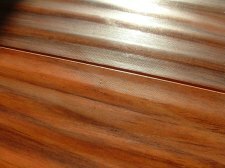 This laminate flooring allows you to have the look of expensive wood flooring for a fraction of the cost. The core is very strong, it's hard to damage. There wasn't any damage to speak of during shipping. This flooring is very durable, it will hold up good with large pets and children. The overall look of this floor is excellent. I highly recommend this flooring. All the joints were tight and flat. The beveled edge helps to hide any imperfections that may occur.